Every now and then a video virtually makes itself. I don't know if it is the subject, the excitement of something new or just magic but what started out as popping out to the workshop to video the opening of a box turned into a fully made episode before I knew what had happened. The last episode took 2 weeks to make. I was lucky enough to see the development of this product some 8 years ago just after Kent finished making his Joes 4x4 Hybrid. I remember watching the prototypes he produced and posted on the Joescnc forum. The care and attention he put into the design and the carefull selection of material. Where you and I might have been happy to use anything with bristles, Kent sent his time trying different brushes until he found one that he was happy with. I'm glad he did because 7 1/2 years after buying my Dustshoe the bristles on my brush look as good as the day I bought it. I remeber one day leaving the brush sitting on the table and something ended up laying across it so that a couple of days later when I spotted it the bristles looked like a kids paint brush that had been abused and was only good for the rubbish bin. I was not impressed that I had been so careless with the brush but I left the brush sitting on the table with the bristles facing up and when I came back later on in the day it was back to normal. I have never looked back. The one modification I made to mine as soon as I received it was to add a couple of washers to the clamp to prevent the accidental over tightening of the calmp bolt. Given that perspex can be broken if abused, I recommend that you do something similar should you get one. This design to the best of my knowledge is the first to have the brush that is held on my magnets. It is see through to make changing the router bit easier as well as you can see what is going on. Lastly it has a 2nd brush inside to help prevent the bristles being sucked into the extraction hose. 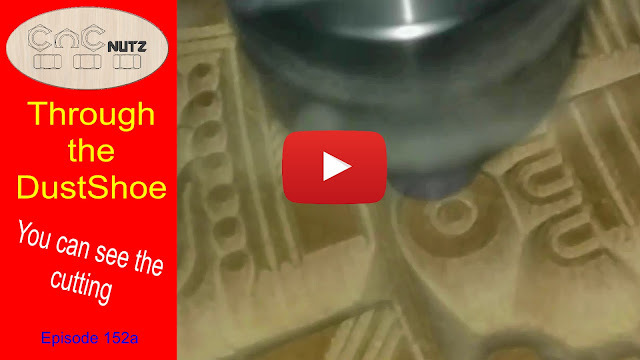 Here is a short video clip of watching a project being cut as seen through the dust shoe. Thats all I have for this week. I have a smaller dust shoe that came with my Stepcraft 2/840 CNC kit. It also has a split system using rare earth magnets. So easy to remove the brush and change the bit. https://stepcraft.us/product/exhaust-adapter-for-hf-350500-spindle . I do like to idea of a bigger shoe from kentcnc. Might look into it.